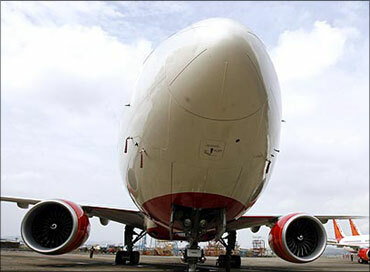 The aviation sector needs $30 billion worth of investment over the next 15 years to keep up with booming passenger and cargo traffic, Secretary Nasim Zaidi said on Friday. "We must have a long-term planning matched with a vibrant regulatory framework as Indian aviation has all the necessary ingredients to grow exponentially," he said at an Assocham event in New Delhi. Zaidi said 12 greenfield airports are currently being developed in different parts of the country, providing an opportunity to become a global hub for airlines. A total of 142 million passengers checked in and out of airports across the country during 2010-11, marking a growth of 15 per cent over the previous year, he added. Further, he said that state aviation secretaries will soon meet to provide inputs for toning up infrastructure. 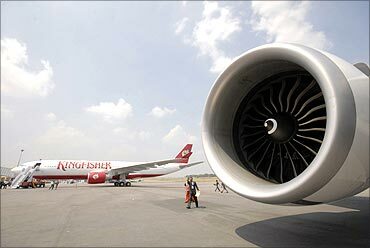 Image: An Air India Airbus A321 sits on the tarmac as a Kingfisher Airlines aircraft takes off. The industry also needs foreign investments to set up training institutes in various areas, especially to train air traffic controllers, Zaidi added. According to estimates, passenger traffic is likely to be around 540 million by 2025 as the fleet size of scheduled airlines increases to 1,500 from 430 now. At the same time, cargo traffic is expected to touch 9 million tonnes from 2.33 million tonnes in the last financial year. EduVARTA: Using SMS to educate rural youth!